For all your rendering needs..
We are a family run rendering business in Melbourne and Eastern Suburbs and provide quality work at a competitive price. We are proud of our work and only use quality products. C&C Webb Plastering was founded by Cairn Webb approx thirty years ago. As a plasterer for most of his life, Cairn decided to start up a family business in Melbourne, his sons Andrew and Tony continue the tradition. As a small Melbourne business, we pride ourselves on quality workmanship, which shows in all our finished work. We remain a small business for a reason, and that is to control and maintain our high standards. We believe in only using quality products which are guaranteed to last and maintain the finishes we require. We also supply, install and render polystyrene panels. Foam cladding is now becoming very popular in Melbourne for new extensions. It is far superior to blueboard (when installed correctly) for straightness, durability and resistance to movement. It has great thermal insulation properties. A 75mm M grade foam panel will give you an R rating of 1.95. We fix foam panels to frames on new homes using specially made screws and washers. We also fix foam panels to weather board homes fixing directly to weatherboards. Once we have fixed the panels to the building we install stainless steel angles to all externals such as window reveals, heads, sills, bottoms of walls and external corners to add strength and straightness. We then completely cover exterior area of foam sheets with fibreglass mesh, bedded with two coats of special mix acrylic. Third coat is then applied with acrylic render. The last coat applied with one coat of Dulux Coventry Coarse in selected colour. As usual, we protect All windows, floors and roof tiles with masking and adequate drop sheets. This is the correct procedure for installing and rendering foam panels. Many rendering firms in Melbourne do not do this and skip important parts. The end result could be cracks, uneven lines on externals and surface and even leakage. We offer two options of rendering. The first being Acrylic render, the second solid render (cement render) Most buildings can be done in acrylic render but if the brickwork is bad (walls not straight and level) then solid render must be used. To maintain straightness we render the walls of a building with two coats of acrylic render (the first coat screeded first) The walls are then floated and left to cure. The final coat of Dulux texture is then applied later in almost any colour you want. Note; If solid render is required, thicker coats of sand and cement render are applied to walls and then screeded straight with straight edges plumed and levelled. Solid render is mainly used by renderers for high build areas where thick coats of render are required. It is often used when renovating old homes in Melbourne as many internal walls need to be re-rendered. In most cases solid render is the best choice in these old homes because of thickness required and the faster drying time of solid. White set plaster is then applied over the render. Solid render is a cement & sand based render that has been around for a long time in history. In recent times it has been replaced by an acrylic based render. Most renderers in Melbourne today use acrylic render because it is far more economic material to use as it is less labour intensive and greatly increases productivity. As a material cost, acrylic render actually costs more to use, but it is the saving in labour costs that make this material cost effective. It is great for potential customers as this product has reduced the labour costs quite considerably allowing more people to enter the market for rendering. You home will most likely be rendered in acrylic render and we will advise you on site which way to go. Regardless of which material used the end result will be the same, a beautifull rendered home! We are based in Melbourne & Eastern Suburbs. 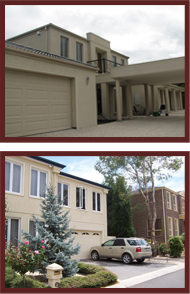 In most cases we will render your house in Melbourne and the Eastern Suburbs with acrylic render. Sometimes solid render is used if a lot of filling is required. If your walls are in good shape, only two coats of acrylic render are needed before the final coat of texture. Preparation is an important process that must be done before any render is laid on the walls. We first dig at least one brick down on the bottom of walls to ensure that the render finishes below the surface. We then clean all foreign material of the walls with a jet blaster. Mesh is then applied to cracked areas of your house, this will help stop cracks re -accuring. To guarantee straightness external angles are fixed to the walls of every external corner of the building including window reveals and sills. The added benefit of using metal angles is that it protects the corners of building from damage. We also fix cement sheets to lintels above doorways and windows to form an even finish. The added benefit of fixing cement sheets to lintels is that it prevents rust (from the lintel) coming to the surface of the finished render. The cement sheet is an effective barrier to stop rust. It is even more important to use this system on older homes as many lintels at this stage are already showing signs of rust. Apart from this, this method keeps window heads and door ways straight and even. You will be hard pressed to find other plastering firms in Melbourne that do this. Once all the prep work is complete the acrylic render is ready to be applied. After first protecting floor areas and fittings with masking and cloth sheets, the acrylic render is applied. Once the first coat is allowed to set up enough it is then screeded to level the walls. Any high spots are removed at this stage. Once the first coat has set sufficiently, a second coat of acrylic render is applied and floated to leave a flat even surface. The first process of rendering is now complete and the acrylic render is then allowed to cure for at least one week before an acrylic texture finish is applied. We use a Dulux Coventry Texture for this last coat as it is the most superior texture in the market. It is at his stage that your choice of colour is added into the texture. There is no need to paint as the colour is already in the finished coat of texture. To enhance the affect of rendering your home we also offer the choice of fixing architectural mouldings to your home. They look great around your windows and doorways and have a stunning affect. Other moulds such as keystone and stringer moulds are also available, great for those who want to make a statement. We guarantee you will be thrilled with the end result. Rendering is one of the best ways of increasing the value of your home in Melbourne. A finish thats starting to become popular is rough cast. We ofer this option to those who really want something different. Great for feature walls and gables. Traditional rough cast will really make a statement and add character to your home. You will find rough cast has a very long history, it was widely found on medievil buildings especially on panel timber framed houses and even stone buildings. Preparation is much the same as normal render with angles fixed to all corners. A base coat is then first applied and scratched to create a key for the coat of rough cast. A wet mix of sand/cement/lime and stones in the correct ratio is applied to the walls (thrown) evenly across the walls. A very nice finish if done correctly. Over the years we have done quite a few jobs in rough cast. For your interest, we have added a few samples of this finish to the rough cast gallery.